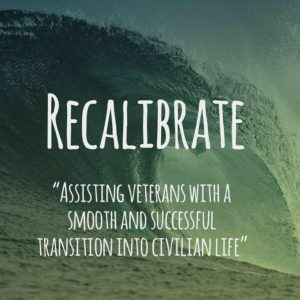 Logo of Recalibrate, a local peer support group for veterans that meets monthly in Toms River. A local peer support group comprised of veterans meets every third Wednesday of the month, putting November’s event on Thanksgiving Eve. In wondering whether to reschedule or not due to the holiday, instead the board of the Recalibrate veterans support group decided the holidays are a time more than ever that veterans may be facing issues that a peer support group could help with. 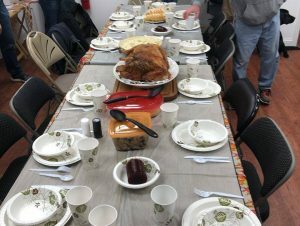 And so, Vetsgiving was born, with the dozen or so participants sharing food, potluck style, of traditional Thanksgiving items, while sharing in camaraderie and combating isolation, anxiety or any issues members might want to talk about. Having the Vetsgiving theme and breaking bread with each other is another way to connect. In particular, says Recalibrate, holidays are tough for some veterans that may feel like they do not have friends or family. The support group wants to reenforce how veterans need to remember they are never alone because of the bonds they share as brothers and sisters, and that they may just need to reach out to one another during these times. Recalibrate, less than a year old, meets at 6:30 p.m. every third Wednesday each month at the Mental Health Association of New Jersey site at 25 South Shore Drive in Toms River. Johnny Roth served in the Marines from 2007-2018 seeing deployment to Iraq and Afghanistan and is one of the board members of Recalibrate. He and the other veterans on Recalibrate wanted to form a free, peer support group that could be a place where veterans could reconnect and feel comfortable. Often the transition from the military to civilian in difficult, and Roth said simply having a place to go among peers and talk about anything is a step forward on that veteran’s journey, he said. “In the military it is mission based, and when you become a civilian it can leave you feeling you have no mission,” Roth said. Reconnecting, or recalibrating, is part of that process. “It’s welcoming and friendly, but it also has that ribbing that we do between branches of the military, and the guys that come out can share in those laughs and camaraderie,” he said, adding that participants come to also share resources about other veterans groups or how to navigate benefits issues, or open up about mental health concerns they might have. The group regularly has between six to 13 participants each month at its peer support group, but Recalibrate also schedules another meet-up as a gym workout they can do together the third Sunday each month. Apache Crossfit on the corner of Hooper Avenue and Fischer Blvd is a regular host. “Some might be hesitant to come out because of the shape they are in but everyone is welcome regardless of your fitness level. We encourage each other, cheer each other on,” Roth said. He believes a physical workout can often be the impetus to measuring and launching toward other goals and is lending itself to that ‘recalibrate’ theme. Roth explained the name Recalibrate was chosen based on the quote “Get up, dust off, reload, recalibrate, reengage,” and the “recalibrate” resonated as a great way to describe the mission of a peer support group. To connect with Recalibrate, visit their Facebook page here.